Nov. 22, 2017 1:10 p.m. The latest in a string of acts of vandalism has the parishioners of a B.C. church worried. 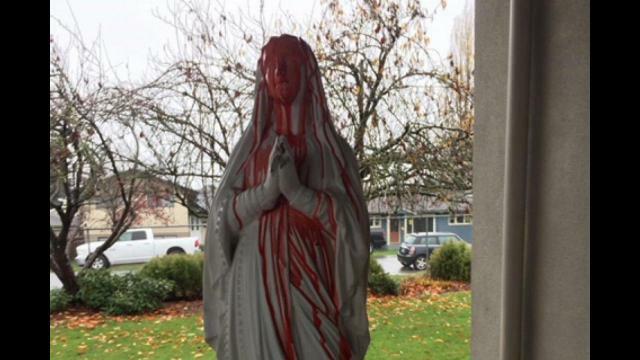 Vandals poured fake blood over the statues of Jesus Christ and the Virgin Mary outside of Cloverdale’s Precious Blood Parish on Monday night. They also splashed fake blood on an outside wall and drew a pentagram in fake blood on the concrete in front of the church. Two days later, traces of the fake blood are still visible. It didn’t quite wash off of the parish wall, and drops of blood can still be seen on the statues. It was more upsetting that it happened at night, she added, as the first people that arrive on the grounds in the morning are children who attend the morning daycare program. Ruiz called the RCMP, as they have a “growing file” on the vandalism at the parish. The container of fake blood was not retrieved as evidence, she said, as it was in the elements and anyone could have picked it up. The incident follows a break-in in late August. The Cloverdale Catholic School, located on the parish grounds, was broken into and the exterior walls of the parish were vandalized with black paint. Mostly, she said she was concerned the children in the church community. Not only for those attending the Catholic school, but the youth groups that meet at the church, and the morning and after-school daycare program. Karla Erickson, catechism coordinator for Precious Blood Parish, said teenagers have recently been coming by at night. “Nobody wants to scare children, that’s crazy,” said Erickson. “But if you do [bang on the windows] at night to a Grade One-r, they’re all screaming. Precious Blood Parish has been Cloverdale’s only Catholic church since it was established in 1947. RCMP have not yet responded to a request for comment.